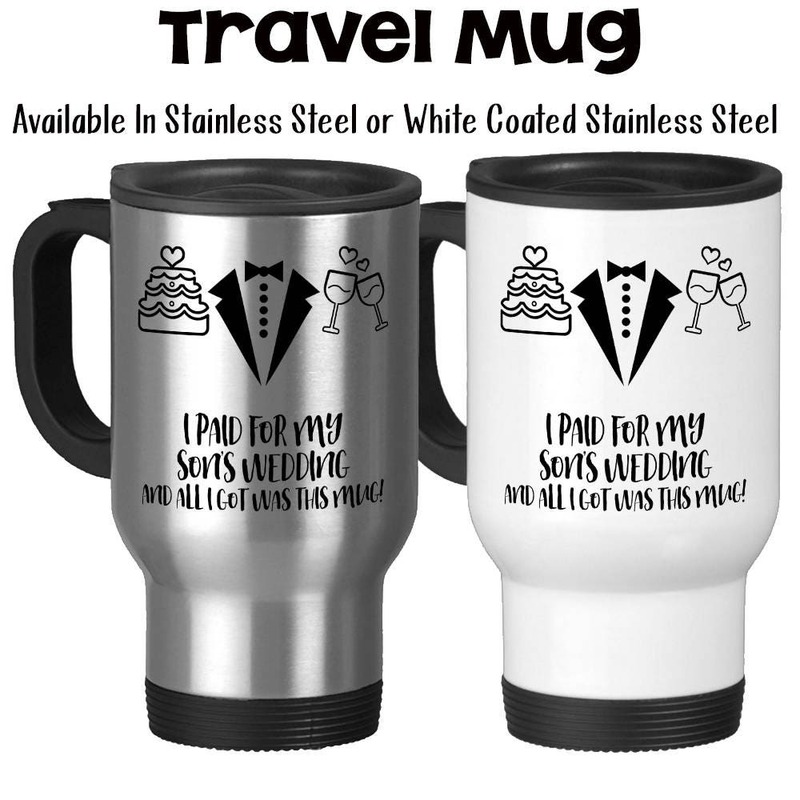 I Paid For My Sons Wedding And All I Got Was This Mug, Mother Of Groom, Father Of Groom, Tuxedo, Wedding Keepsake, Wedding Memorabilia, Wedding Gift, Gift Idea - 14oz Travel Mug Available in Stainless Steel or White Coated Stainless Steel with a resilient plastic lid, handle, and base. ★ 14 oz. Travel Mug - Available in Stainless Steel Exterior or White Coated Stainless Steel Exterior (SS). - White coated mugs are only coated on the outside, both mug styles have plain stainless steel interiors. ★ Approximately 6 inches tall with lid on & 11 inches around (circumfrence) at widest area. ★ Travel Mug comes with a resilient plastic lid, handle, and base. ★ This custom made design is printed on both sides of the travel mug, which makes these great for left-handed or right-handed mug holders and allows the design to be on display as well. ★ Permanent, vibrant, beautiful custom inked design that is bonded to the mug professionally with a high heat press, and will not crack or peel off. This design is not created with stickers or vinyl. ★ Dishwasher safe, although some dishwasher cleaners can be abrasive and hand washing can extend the quality of the mug design for many extra years. This mug design is professionally created and inked in FL. USA. The design is professionally processed to bond permanently with the travel mug itself, and will not crack or peel off. This is not a vinyl or sticker design. Grandma loved it! Been used multiple times with no sign of wear or peeling. Very happy with ship time as well.